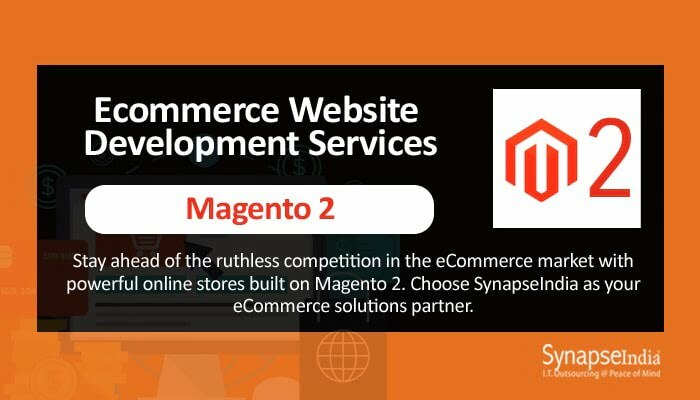 eCommerce website development services provided by SynapseIndia help clients offer a pleasing user experience across the online store, which is achieved by using platforms like Magento 2. With an enormous experience of designing and developing thousands of eCommerce solutions, the developers have created a reputation for building flawless solutions. The company caters to every kind of business -- including small businesses, large companies, and medium enterprises. According to a report published by the “Forbes” magazine, U.S. eCommerce grew substantially in 2018, and sales rose to more than 400 billion dollars. This means that consumers have been increasingly using shopping portals to spend money. Additionally, the popularity dedicated shopping events like Black Friday and Cyber Monday have further increased online commerce opportunity for retailers. Considering all these trends and developments, it becomes undoubtedly crucial for businesses that they deploy a proper eCommerce strategy. And, in order to successfully implement the strategy, businesses need to get the right solution. It's where SynapseIndia has a significant role to play. It has long been a tried and tested technology solutions provider to a large number of online retailers. The company uses eCommerce development platforms like Magento. The versatile framework offers a diverse range of features and functionalities. For instance, it enables the development of a shopping cart for different kinds of shopping experiences – like mobile and in-store.